The IAAI and CFITrainer.Net present these podcasts with a focus on issues relating to fire investigation. With expertise from around the world, the International Association of Arson Investigators produces these podcasts to bring more information and electronic media to fire investigators looking for training, education and general information about fire investigation. Topics include recent technologies, issues in the news, training opportunities, changes in laws and standards and any other topic that might be of interest to a fire investigator or industry professional affected by fire. Information is presented using a combination of original stories and interviews with scientists, leaders in fire investigation from the fire service and the law enforcement community. Welcome to this edition of the IAAI’s CFITrainer.Net podcast. A few quick items before we get into the news. The IAAI is pleased to announce that there is an IAAIEvidenceGuide.com, it's a new web site, its delivering detailed written recommendations, procedures and video demonstrations for how to collect over 50 types of evidence found at fire scenes. The procedures were developed and vetted over a one year period by 5 evidence collection and testing experts. There's over 90 pages of written content and numerous demonstration videos. Many months were put into researching, writing, and refining each procedure. The site also contains collection checklists for the fire scene and an FAQ of more than 40 common evidence collection questions, covering everything from how to collect a potential ignitable liquid floating in a pool of water to whether or not cyanoacrylate fuming hinders subsequent DNA analysis. All content is freely available at no charge as a service to the profession. The procedures are in alignment with the practical skills necessary to earn the IAAI-ECT designation, so this web site is a fantastic resource for professionals working on earning that credential. You can check the site out right now at IAAIEvidenceGuide.com. And, if you are a CFITrainer.Net registered user, you should have gotten an email about the site, so we ask you to do a favor, could you forward that to any colleagues you have that may benefit from using IAAIEvidenceGuide.com. We'd appreciate that. The 2019 election for IAAI’s Board of Directors is open for voting until Tuesday April 16 at noon Eastern Daylight Time. Voting has been active this year. IAAI Active and Life members are encouraged to vote. Your membership must be current to have voting privileges. You should have received an email with the ballot on February 19th. If you did not or have questions, contact the IAAI Office 800-468-IAAI or via email at membership@firearson.com. It’s your last chance, it’s coming up the IAAI’s 2019 International Training Conference & Expo in Jacksonville, Florida, your last chance to register. The conference runs from April 14-19. Don’t miss this opportunity to stay current on a variety of topics by taking dozens of hours of training in one place. View the full schedule of classes and register at iaaiitc.com. Now let’s get to some news. On March 15, 2019, a massive fire destroyed the New England Casket Company in East Boston. It was fueled by combustibles in the building, including piles of lumber, bags of sawdust, and chemicals, the fire reached nine alarms and took hours to suppress. News media have reported that the owner of the company stated that the fire began in a furnace that heats the room where the caskets dry and that the area of origin was above the sprinkler system, therefore the sprinklers could not suppress the initial fire. We will keep an eye on this story as the investigation conclusions are reached. An article from the Coast Mountain News of Canada details how many researchers are trying to use artificial intelligence to predict where wildfires are most likely to start. The research is focusing on how artificial intelligence might be able to figure out which of many data points are correlated and then extrapolate these correlations into a predictive model. This is just another example of how fire data is extremely important in fire protection and has potential to be a data point in ways we could not have anticipated only a few years ago. You can read more about this research using the link on the podcast’s page. Very often, as we comb through our news sources for articles to feature on this podcast, we come across a fire that is called “undetermined.” The most recent example is a fire at the Bluebird fruit warehouse in Peshastin, Washington on March 3, 2019. The investigation was a joint effort between the Chelan County Department of Fire Prevention and Investigation, ATF, and the Chelan county Sheriff’s Office. Fire investigators from Travelers Insurance also worked the case. Even with all these resources and investigative expertise, investigators could not conclusively determine the fire cause. Even though investigators identified the area of origin and a light as a possible cause, they could not rule out the possibility that the fire was intentionally set, and therefore had to call the fire undetermined in both cause and classification. The concept of undetermined is sometimes misunderstood, so we have an entire module on CFITrainer.Net called “Understanding Undetermined” which takes a deep dive into issues like these and can provide you with guidance on when an undetermined cause and/or undetermined cause classification is appropriate. Take a look at the module we think it will sharpen your grasp on this topic. If you enjoyed these stories and find the podcast valuable, consider supporting CFITrainer.Net with a donation. CFITrainer.Net is supported by grants, by the IAAI funds, and by donations from listeners like you. IAAI has applied for a USFA Fire Protection and Safety grant in this most recent cycle, however applications do not guarantee selection of a grant recipient. Your donations help keep this podcast on the air, modules being developed and CFITrainer alive. We want to get you the latest in fire investigation and good training and we want to keep it going for years to come. Use that red “Donate Today” button on the page to make your donation. 100% of what you give goes directly to CFITrainer.Net’s operating costs. We thank you for your support. Thanks for joining us today on this podcast. Stay safe and we’ll see you next time on CFITrainer.Net. For the IAAI and CFITrainer.Net, I’m Rod Ammon. Fisher, Jenna. 9-Alarm fire finally out at East Boston casket factory. Patch.com. 15 March 2019. Demolition begins after East Boston fire leaves family-owned casket company 'completely gutted.' CBS Boston. 16 March 2019. Weber, Bob. Researchers look to artificial intelligence programs to predict wildfires. The Canadian Press via Coast Mountain News. 17 March 2019. Lamb, Kyle. Bluebird fire investigation begins demolition amid 'undetermined' cause. Newsradio 560KPQ. 13 March 2019. February 2019 Podcast - February '19 IAAI & CFITrainer Fire Investigator Podcasts. This month take 10 mins and hear some fire investigation and IAAI news. January 2019 Podcast - January '19 IAAI & CFITrainer Fire Investigator Podcasts. This month we’re looking back on some of the biggest issues in fire investigation in 2018. November 2018 Podcast - November '18 IAAI & CFITrainer Fire Investigator Podcasts. This month we talk with Jeff Pauley from the IAAI’s Health and Safety Committee. Jeff is an IAAI-CFI and the Chairman of the Health and Safety Committee. In this podcast, he talks about ways to reduce exposure to carcinogens related to fire investigation. By listening, you will learn about ways to reduce your risks, learn about new resources that are available to assist you, and research that is coming soon. October 2018 Podcast - October '18 IAAI & CFITrainer Fire Investigator Podcasts. This month meet and learn about IAAI’s new Executive Director, Scott Stephens and plans for the future. After that interview, hear some wild stories from the national news related to fire investigation. September 2018 News Roundup - September '18 IAAI & CFITrainer Fire Investigator Podcasts. Short stories related to fire investigation - June '18 IAAI & CFITrainer Fire Investigator Podcasts. Join us for a brief Podcast that includes five minutes of short stories related to fire investigation. What you need to know about Arson Awareness week - April '18 IAAI & CFITrainer Fire Investigator Podcasts. This month we welcome Tonya Hoover, the Superintendent of the National Fire Academy. Superintendent Hoover came to the NFA with more than 20 years of experience in local and state government, most recently as the California State Fire Marshal. Growing pot and earning Bitcoin can start fires? - March '18 IAAI & CFITrainer Fire Investigator Podcasts. In this month’s podcast, hear a story about how the Bitcoin business might be causing fires? What similarities are there between Pot growers and now Bitcoin miners? Training related to wildland fire investigation - February '18 IAAI & CFITrainer Fire Investigator Podcasts. This month’s podcast highlights new training related to wildland fire investigation featuring an interview with Paul Way, and this year’s International Training Conference. We also have a pretty wild story before we wrap up. Birds starting fires? Smart homes and digital data gathering issues - December '17 IAAI & CFITrainer Fire Investigator Podcasts. In this podcast, we discuss two topics on the technology and forensics cutting edge. Michael Custer of Kilgore Engineering, Inc. and retired Special Agent Tully Kessler share some knowledge and give us a taste of the classes that they will be presenting at ITC 2018. Discussion with Writer Monica Hesse - September '17 IAAI & CFITrainer Fire Investigator Podcasts. In this podcast, you will hear some great news related to the IAAI and CFITrainer.Net and then we have an interview with Monica Hesse, the writer of a new book called "American Fire: Love, Arson, and Life in a Vanishing Land." Discussion with Criminalist- John DeHaan - June '17 IAAI & CFITrainer Fire Investigator Podcasts. This month on the CFITrainer.Net podcast, we talk to Criminalist, fire investigation expert and Author of "Kirk’s Fire Investigation", John DeHaan. The Ghost Ship - May '17 IAAI & CFITrainer Fire Investigator Podcasts. For this podcast, we hear from a retired Captain of the Long Beach Fire Department, Pat Wills. Pat has been in the fire service for 37 years. He has been a leader and an investigator, now he is an educator speaking around the country about the importance of code enforcement. Fast Podcast about ITC! - March '17 IAAI & CFITrainer Fire Investigator Podcasts. This month we talk to David Bridges about what to expect at ITC and the training you won’t want to miss. CFITrainer Podcast- A profile with an IAAI-CFI® - February '17 IAAI & CFITrainer Fire Investigator Podcasts. Join us this month for our podcast as we interview IAAI member and CFI, Jeff Spaulding from Middletown, Ohio. Jeff talks about his work in both the public and private sector and then he shares an interesting story about how a pacemaker is helping in an investigation. An interview with Dr. James Quintiere - December '16 IAAI & CFITrainer Fire Investigator Podcasts. In a discussion with Dr. James Quintiere, we learn about some of his work in fire sciences, a bit about his research, his opinions related to the World Trade Center investigation and what he thinks is important to fire investigation as a scholarly leader in our field. Fire Investigation After the Flood Podcast - November '16 IAAI & CFITrainer Fire Investigator Podcasts. This month we talk to Dan Hebert, an IAAI, CFI about "How Floods affect Fire Investigation." September 2016 CFITrainer.Net Podcast - September '16 IAAI & CFITrainer Fire Investigator Podcasts. This month we talk about the recent changes in the FAA's regulations for commercial and public sector use of UAS or "Drones". July 2016 CFITrainer.Net Podcast - July '16 IAAI & CFITrainer Fire Investigator Podcasts. This month we talk to Fire Marshall, Ken Helms of the Enid, OK. Fire Department about his team winning the Fire Investigator of the Year award. March 2016 CFITrainer.Net Podcast - March '16 IAAI & CFITrainer Fire Investigator Podcasts. This month's fire investigation podcast from the IAAI's CFITrainer.Net focuses on the Youth Firesetting Information Repository and Evaluation System, which is called YFIRES for short. February 2016 CFITrainer.Net Podcast - February '16 IAAI & CFITrainer Fire Investigator Podcasts. This month's fire investigation podcast from the IAAI's CFITrainer.Net focuses on what you need to do to ensure the integrity of samples sent to the lab. A conversation with Laurel Mason of Analytical Forensic Associates. September 2015 CFITrainer.Net Podcast - September '15 IAAI & CFITrainer Fire Investigator Podcasts. Our podcast related to the legalization of recreational marijuana and its effect on fire investigation was one of the most popular podcasts ever on CFITrainer.Net. This month’s podcast is a follow up with one of our listeners from California who is an investigator doing training on this very topic. August 2015 CFITrainer.Net Podcast - August '15 IAAI & CFITrainer Fire Investigator Podcasts. This month's podcast is about NFIRS where we interview the Executive Director of The National Association of State Fire Marshals Fire Research and Education Foundation, Jim Narva. July 2015 CFITrainer.Net Podcast - July '15 IAAI & CFITrainer Fire Investigator Podcasts. In this special edition of podcast we’re going to meet the newest IAAI Investigator of the Year, Andrea Buchanan. May 2015 CFITrainer.Net Podcast - May '15 IAAI & CFITrainer Fire Investigator Podcasts. This month's Arson Investigator podcast from IAAI & CFITrainer interviews Jason McPherson from MSD Engineering to talk about some of these new technology tools. 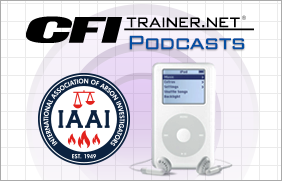 April 2015 CFITrainer.Net Podcast - April '15 IAAI & CFITrainer Fire Investigator Podcasts. This month's Arson Investigator podcast from IAAI & CFITrainer interviews Dave Perry, a lawyer in Colorado discussing what fire chiefs, fire investigators, and the legal system are seeing in a state with legalized cannabis in regard to fire cause involving marijuana. February 2015 CFITrainer.Net Podcast - Feb '15 IAAI & CFITrainer Fire Investigator Podcasts. This month's Arson Investigator podcast from IAAI & CFITrainer interviews Mike Schlatman and Steve Carman who are both successful fire investigators and now business owners who have transitioned from the public to the private sector. December 2014 CFITrainer.Net Podcast - December '14 IAAI & CFITrainer Fire Investigator Podcasts. This month's podcast interviews Steve Avato from the Bureau of Alcohol, Tobacco, Firearms and Explosives explaining the process of elimination and how it is a critical part of the scientific method. June 2014 CFITrainer.Net Podcast - June '14 IAAI & CFITrainer Fire Investigator Podcasts. This month's podcast interviews the 2014 Investigator of the Year. April 2014 CFITrainer.Net Podcast - April '14 IAAI & CFITrainer Fire Investigator Podcasts. This month's podcast interviews with Don Robinson, Special Agent in Charge with the Bureau of Alcohol, Tobacco, Firearms and Explosives. Currently stationed at the National Center for Explosives Training and Research, located at the Redstone Arsenal in Huntsville, Alabama. January 2014 CFITrainer.Net Podcast - January '14 IAAI & CFITrainer Fire Investigator Podcasts. This month's podcast takes a look inside the process of revising NFPA 921 and NFPA 1033. October 2013 CFITrainer.Net Podcast - October '13 IAAI & CFITrainer Fire Investigator Podcasts. This month's podcast focuses on the fire research work of Underwriters’ Laboratories, better known as UL. Mid Year 2012 CFITrainer.Net Podcast - Mid Year '12 IAAI & CFITrainer Fire Investigator Podcasts. This podcast features a mid-year update on the IAAI’s new initiatives and ways for you to get more involved with the organization. September 2012 CFITrainer.Net Podcast - September '12 IAAI & CFITrainer Fire Investigator Podcasts. This month's podcast features an in-depth look at the recent live-burn fire experiments exercise conducted on Governor’s Island, New York by the New York City Fire Department, the National Institute of Standards and Technology, Underwriters Laboratory, and the Trust for Governor’s Island. August 2012 CFITrainer.Net Podcast - August '12 IAAI & CFITrainer Fire Investigator Podcasts. This is a special edition of the CFITrainer.Net podcast previewing the ITC 2013. There’s a new name for the Annual Training Conference from the IAAI now called the International Training conference. April 2012 CFITrainer.Net Podcast - April '12 IAAI & CFITrainer Fire Investigator Podcasts. This month's podcast features an interview with Chief Ernest Mitchell, Jr., the US Fire Administrator. Also we will discuss the upcoming ATC, Annual Training Conference, from the IAAI about to happen in Dover, Delaware. March 2012 CFITrainer.Net Podcast - March '12 IAAI & CFITrainer Fire Investigator Podcasts. This month's podcast features an interview with ATF Special Agent Billy Malagassi out of the Tulsa, OK Field Office about investigating fires in clandestine drug labs. We also report on NIST’s findings in the Charleston Sofa Super Store fire and IAAI’s Evidence Collection Practicum. December 2011 CFITrainer.Net Podcast - December '11 IAAI & CFITrainer Fire Investigator Podcasts. This month's podcast features one of the presenters from this year’s IAAI ATC and see how a single photo broke the Provo Tabernacle fire case. October 2011 CFITrainer.Net Podcast - October '11 IAAI & CFITrainer Fire Investigator Podcasts. This month's podcast features an interview with Deborah Nietch, the new Executive Director of IAAI. July 2011 CFITrainer.Net Podcast - July '11 IAAI & CFITrainer Fire Investigator Podcasts. This month's podcast features an interview with Tom Fee discussing details of investigating wildland fires. May 2011 CFITrainer.Net Podcast - May '11 IAAI & CFITrainer Fire Investigator Podcasts. This month highlights the IAAI ATC in Las Vegas and the third installment in the "It Could Happen to You" series. ATC 2011 CFITrainer.Net Podcast - This podcast discusses the upcoming IAAI Annual Training Conference and National Arson Awareness Week. April 2011 CFITrainer.Net Podcast - April '11 IAAI & CFITrainer Fire Investigator Podcasts. This podcast announces the release of the program, The First Responder’s Role in Fire Investigation, which teaches first responders how to make critical observations and take important scene preservation actions at a fire scene. March 2011 CFITrainer.Net Podcast - March '11 IAAI & CFITrainer Fire Investigator Podcasts. This month’s podcast features some of the instructors from the upcoming 2011 Annual Training Conference, to provide a preview of the courses they will be presenting. January 2011 CFITrainer.Net Podcast - January '11 IAAI & CFITrainer Fire Investigator Podcasts. This month’s podcast features the release of the new edition of Fire Investigator: Principles and Practice to NFPA 921 and 1033, new flammability requirements from UL for pre-lit artificial Christmas trees and a growing fire problem in Dubai with factories turned into worker dormitories. December 2010 CFITrainer.Net Podcast - December '10 IAAI & CFITrainer Fire Investigator Podcasts. This month’s podcast focuses on home candle fires, lightning punctures in gas piping, and respiratory diseases in the fire services. November 2010 CFITrainer.Net Podcast - November '10 IAAI & CFITrainer Fire Investigator Podcasts. This month’s podcast features research findings for structural stability in engineered lumber by UL, the ban on antifreeze in residential sprinkler systems, and the National Highway Traffic Safety Administration’s investigation of Jeep Grand Cherokee fuel tanks. October 2010 CFITrainer.Net Podcast - October '10 IAAI & CFITrainer Fire Investigator Podcasts. This month’s podcast features high-profile fire cases, why people leave stovetop cooking unattended and how new sensors under development may improve fire research. September 2010 CFITrainer.Net Podcast - September '10 IAAI & CFITrainer Fire Investigator Podcasts. This month’s podcast features how to use the ATF’s Bomb Arson Tracking System, IAAI Foundation grants, electrical fires and indoor marijuana cultivation. August 2010 CFITrainer.Net Podcast - August '10 IAAI & CFITrainer Fire Investigator Podcasts. This month’s podcast focuses on social media as a fire investigation tool, a potential problem with modular home glued ceilings and research from Underwriters Laboratories on the effects of ventilation on structure fires. July 2010 CFITrainer.Net Podcast - July '10 IAAI & CFITrainer Fire Investigator Podcasts. This month’s podcast is a roundtable on some of the latest research and technical activities that impact fire investigation, featuring Daniel Madrzykowski (moderator), Steven Kerber, and Dr. Fred Mowrer. June 2010 CFITrainer.Net Podcast - June '10 IAAI & CFITrainer Fire Investigator Podcasts. This month’s podcast discusses career advancement, budget cuts and their impact on fire investigation, and the 2010-2016 ATF Strategic Plan. ATC 2010 CFITrainer.Net Podcast - Follow-up and Interviews from Orlando. Learn about the conference, hear what attendees had to say. May 2010 CFITrainer.Net Podcast - May '10 IAAI & CFITrainer Fire Investigator Podcasts. The second in our safety series called "It Could Happen To You." Our Long-Term Exposure roundtable is moderated by Robert Schaal. April 2010 CFITrainer.Net Podcast - April '10 IAAI & CFITrainer Fire Investigator Podcasts. The first of our two-part safety series called "It Could Happen To You." Our roundtable is moderated by Robert Schaal. March 2010 CFITrainer.Net Podcast - March '10 IAAI & CFITrainer Fire Investigator Podcasts. This month’s podcast features a conversation about legislative affairs affecting the fire service with Bill Webb, Executive Director of the Congressional Fire Services Research Institute. February 2010 CFITrainer.Net Podcast - February '10 IAAI & CFITrainer Fire Investigator Podcasts. This month’s podcast features our interview with a commercial kitchen’s fire expert about what you need to know when you work a commercial kitchen fire. January 2010 CFITrainer.Net Podcast - January '10 IAAI & CFITrainer Fire Investigator Podcasts. This month’s podcast features a look at preliminary research on corrosion caused by Chinese drywall, a new database focused on fires in historic buildings, a warning on blown-in insulation, and the launch of the new firearson.com web site. December 2009 CFITrainer.Net Podcast - December '09 IAAI & CFITrainer Fire Investigator Podcasts. This month’s podcast features cooking fires, highlights of the International Code Council’s Annual Meeting on code requirements, including requiring residential sprinkler systems, and an easy way to keep up with recalls from the US Consumer Product Safety Commission. November 2009 CFITrainer.Net Podcast - November '09 IAAI & CFITrainer Fire Investigator Podcasts. This month’s podcast features chimney fires, including recent news on surgical flash fires, a proposed national arsonist registry, lightning research and an innovation in personal protective equipment. October 2009 CFITrainer.Net Podcast - October '09 IAAI & CFITrainer Fire Investigator Podcasts. This month’s podcast is devoted to Fire Prevention Week. September 2009 CFITrainer.Net Podcast - September '09 IAAI & CFITrainer Fire Investigator Podcasts. This month’s podcast features the relationship between climate conditions and fire risk, new research on formulating fireproof walls and the latest in IAAI news. August 2009 CFITrainer.Net Podcast - August '09 IAAI & CFITrainer Fire Investigator Podcasts. This month takes a look at the dangerous combination of summer heat and oily rags, the rise in vacant home fires, and preview research underway on Australia’s devastating "Black Saturday" brush fires. July 2009 CFITrainer.Net Podcast - July '09 IAAI & CFITrainer Fire Investigator Podcasts. This month features a look at outdoor grill fires, a fatal fire at a homeless camp in Southern NJ, new NIST research on human behavior during building fires, and IAAI news. June 2009 CFITrainer.Net Podcast - June '09 IAAI & CFITrainer Fire Investigator Podcasts. This month’s podcast features live reports from the 2009 IAAI Annual Training Conference held in May. May 2009 CFITrainer.Net Podcast - May '09 IAAI & CFITrainer Fire Investigator Podcasts. This podcast is dedicated to National Arson Awareness Week. April 2009 CFITrainer.Net Podcast - April '09 IAAI & CFITrainer Fire Investigator Podcasts. This month’s podcast features the NFPA 921 chapter on marine fire investigations and the myth and reality of static electricity as a source of ignition. March 2009 CFITrainer.Net Podcast - March '09 IAAI & CFITrainer Fire Investigator Podcasts. This month focuses on the rise of the hybrid vehicle and what its unique engineering means for the investigation of vehicle fires, the rash of devastating arson fires in Coatesville, Pennsylvania from December 2008 to February 2009, and news from IAAI. January 2009 CFITrainer.Net Podcast - January '09 IAAI & CFITrainer Fire Investigator Podcasts. This month’s podcast focuses on the deepening financial crisis in the US and arson for profit fires, how going green may pose a fire hazard and see how rope lighting may be a source of ignition, and IAAI’s Expert Witness Courtroom Testimony course. December 2008 CFITrainer.Net Podcast - December '08 IAAI & CFITrainer Fire Investigator Podcasts. This month’s podcast features Christmas tree fires, changes to critical fire investigation publications, the weak economy’s impact on home fires, wind’s effect on structure fires, and ATC 2009.